Thank you to all of you who celebrated our 5th Anniversary with us this past weekend. It is always a pleasure to see each of you but even better to remember where we all started and how far all of you have come. There were so many of our "beginners" that are now accomplished quilters. Hurray!! Thank you for your support over the years. We do appreciate it. The POKEY Challenge has been decided---thanks to all who participated. You guys and gals are the best!!!! What a difficult decision. The viewer's choice favorite was from Susie Smith. The JaM awards are 1st- Denise Cargill, 2nd- Gail Freese and 3rd to Susie Smith. Stop by for your awards gals. We would like to keep your entries for another few days for everyone to enjoy but we will be happy to return all entries when you visit the store. First Place - Denise C.
Second Place - Gail F.
Third Place and Viewer's Choice - Susie S.
Two DUFFLE BAG classes with Kim Ewing- this project makes a great gift for any member of your family, or better yet, yourself. We can't wait to make one. The fee includes you pattern for the bag. Classes are Wednesday, Feb 2nd or Friday, Feb 11th $35. 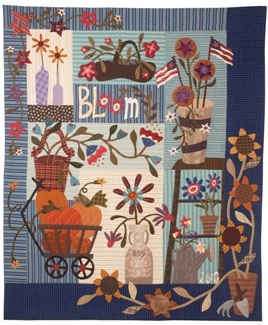 Fusible Applique classes of Whimsical Garden and Farm Fresh both start this week. The sample of Whimsical Garden is "Complete", yes, quilted, bound and a sleeve!!! This class is Friday morning, 9 - 12 followed by 2 other dates. Farm Fresh starts on Saturday morning. Check out our website. www.jampatch.com classes for details. Although many of our projects later in the are continuations we are offering a new class with Kathy Ward on Thursday, Feb 17th, "Port Hole Ibis". This class will teach curved piecing, fusible applique and thread painting. What a great lesson for only $35; this includes your pattern. A local group, "Gone to Pieces Quilters", have a display at the Robert Morgade Library. Thursday, Feb 3rd, 5:30 - 7:30 is the opening reception and the exhibit is open to the public on Monday and Thursdays 12:30 - 4:30 throughout the month of February. Thanks ladies for sharing your talents. We cannot forget our visit from Jane Sassaman. We are looking forward to 3 days of Jane's influence and sharing of her techniques. Her classes are full but do stop by to take a peak. Joey and Margy will be in the class but Annie, Jackie, and Sandy will be there to help you at the store. We are so excited to get to particpate. New items are arriving. The Rulers that Marsha was here to share are in and if you prepaid, we have your orders. For those of you who couldn't make it, stop by and we will show you them. There are new patterns and books to make you drool. We also have new fabric arriving from Benartex that includes a 2011 Christmas panel and all. Wait till you see this. University of Miami and University of Florida and Florida State fabrics have arrived in. They are great! We have a new book that Margy and I are excited about "New York Beauty Simplified" but more excited about the stencils have arrived in to quilt the pieces when you are done. They are terrific. The special this week is 25% off Yellows and Golds for our bright sunshine. Aren't we glad we live in Florida this week. The sale begins tomorrow on February 2nd and runs through Saturday, February 5th. Minimum cut is one yard. No Clubhouse Gift Certificates are redeemable on sale merchandise. All Sales are final. Hope to see you soon.